It’s not news that Americans aren’t saving enough. The typical baby boomer, whose generation is just starting to retire, has a median of $147,000 in all of his retirement accounts, according to the Transamerica Center for Retirement Studies. And if you think that’s depressing, try this on: 1 in 3 private sector workers don’t even have a retirement plan through their job. But the new year brings with it some good news: If people do have a 401(k) plan through their employer, there’s data showing them choosing to set aside more for their later years. 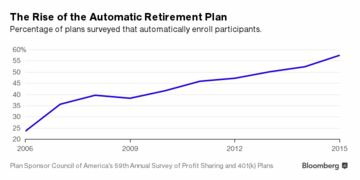 On average, workers in 2015 put 6.8 percent of their salaries into 401(k) and profit-sharing plans, according to a recent survey of more than 600 plans. That’s up from 6.2 percent in 2010, the Plan Sponsor Council of America found. An increase in retirement savings of 0.6 percentage points might not sound like much, but it represents a 10 percent rise in the amount flowing into those plans over just five years, or billions of dollars. About $7 trillion is already invested in 401(k) and other defined contribution plans, according to the Investment Company Institute. If Americans keep inching up their contribution rate, they could end up saving trillions of dollars more. Workers in these plans are even starting to meet the savings recommendations of retirement experts, who suggest setting aside 10 percent to 15 percent of your salary, including any employer contribution, over a career. While workers are saving more, companies have held their financial contributions steady—at least over the past few years. Employers pitched in 4.7 percent of payroll in 2015, the same as in 2013 and 2014. Even so, it’s still more than a point above their contribution rates in the aftermath of the Great Recession. One reason workers participating in these plans are probably saving more: They’re being signed up automatically—no extra paperwork required. Almost 58 percent of plans surveyed make their sign-up process automatic, requiring employees to take action only if they don’t want to save. Automatic enrollment can make a big difference. In such plans, 89 percent of workers are making contributions, the survey finds, while 75 percent make 401(k) contributions under plans without auto-enrollment. Auto-enrolled employees save more, 7.2 percent of their salaries vs. 6.3 percent for those who weren’t auto-enrolled. Companies are also automatically hiking worker contribution rates over time, a feature called “auto-escalation” that’s still far less common than auto-enrollment. Less than a quarter of plans auto-escalate all participants, while 16 percent boost contributions only for workers who are deemed to be not saving enough. 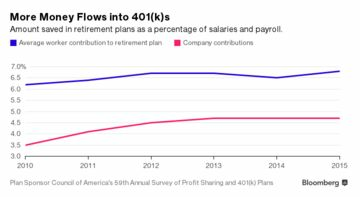 A key appeal of automatic 401(k) plans is that they don’t require participating workers to be investing experts. Unless employees choose otherwise, their money is automatically put in a recommended investment. And, at more and more 401(k) and profit-sharing plans, this takes the form of a target-date fund, a diversified mix of investments chosen based on a participant’s age or years until retirement. 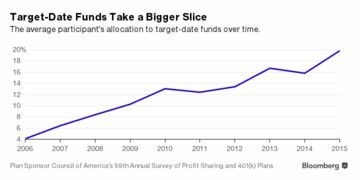 Two-thirds of plans offer target-date funds, the survey found, double the number in 2006. The share of workers’ assets in target-date funds is up fivefold as a result. A final piece of good news for workers is that they’re keeping more of every dollar they earn in a 401(k) account. Fees on 401(k) plans are falling, according to a recent analysis released by BrightScope and the Investment Company Institute. The total cost of running a 401(k) plan is down 17 percent since 2009, to 0.39 percent of plan assets in 2014. The cost of the mutual funds inside 401(k)s has dropped even faster, by 28 percent to an annual expense ratio of 0.53 percent in 2015.